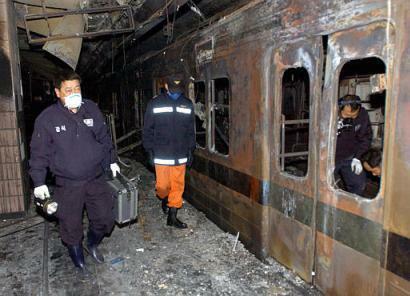 The Daegu subway fire of February 18, 2003 killed at least 198 people and injured at least 147. An arsonist set fire to a train stopped at the Jungangno Station of the Daegu Metropolitan Subway in Daegu, South Korea. 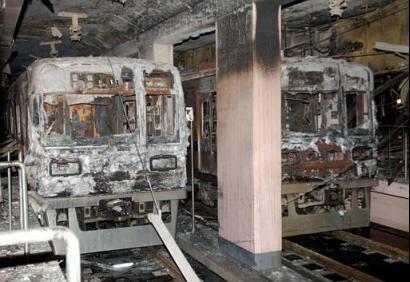 The fire then spread to a second train which had entered the station from the opposite direction. The arsonist was Kim Dae-han, a 56 year-old unemployed former taxi driver who had suffered a stroke in November 2001 that left him partly paralyzed. Kim was dissatisfied with his medical treatment and had expressed sentiments of violence and depression; he later told police he wanted to kill himself, but to do so in a crowded place rather than alone. By most accounts, on the morning of February 18, he boarded train 1079 on Line 1 in the direction of Daegok, carrying a duffel bag which contained two green milk cartons filled with a flammable liquid, possibly paint thinner or gasoline. As the train left Daegu Station around 9:53 a.m., Kim began fumbling with the cartons and a cigarette lighter, alarming other passengers who tried to stop him. In the struggle, one of the cartons spilled and its liquid contents caught fire as the train pulled into Jungangno Station in downtown Daegu. Kim, his back and legs on fire, managed to escape along with many passengers on train 1079, but within two minutes the fire had spread to all six cars. The fire spread quickly in the insulation between the layers of aluminum that form the shell of the cars, the vinyl and plastic materials in seat cushions and strap handles, and heavy plastic matting on the floors, producing thick smoke as it burned. 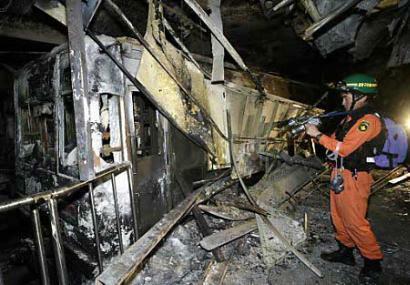 The operator of the train, Choi Jeong-hwan, failed to notify subway officials immediately of the fire. Fire and subway officials in the charred station where all the victims were killed or injured described faulty emergency signals, poor communications and misjudgments on the part of subway workers with little or no training in how to cope with such a situation. "Some of the doors were open and some were closed on the second train," the manager of an emergency fire crew, Chun Pak Chung, said as he headed into the depths of the station. "The control room turned off the power to stop the flames." Investigators were also questioning the engineer on the second of the two trains, who was reported to have fled with the master key to the subway cars' doors, which were shut tight with screaming passengers trapped inside. It was on the second train that most of the victims died after the heat, flames and smoke engulfed them with no means of escape. 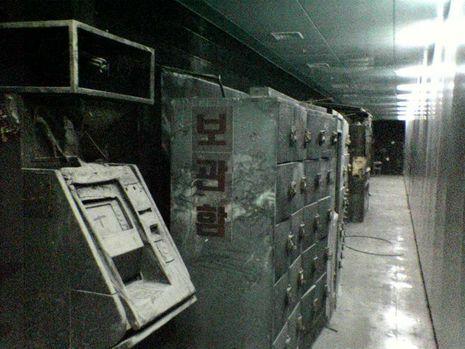 It was revealed on the 23rd that also at the Machine and the Equipment Control Center of the Daegu Subway Corporation at the time of the Daegu Subway Fire, the warning message of ‘fire,’ and the alarm went off with it, but the employees ignored it. 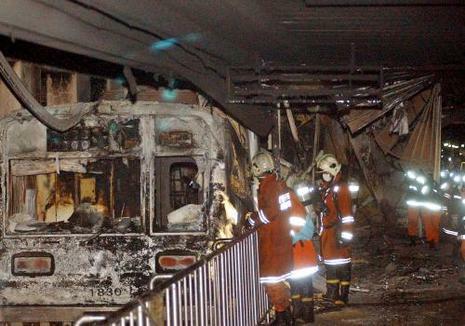 Therefore, the Arson Disaster of the Jungangro Station of the Daegu Subway is being revealed as a man-made disaster that most of the related departments of the Subway Corporation as well as people on duty at the Operating Control Center and the enginemen confronted irresponsibly or immaturely. The Daegu Police Department, which is investigating this incident, revealed that 3 employees, who were working at the Machine and Equipment Control Center including the Chief of the Machine and Equipment Control Team of the Daegu Subway Corporation, Mr. Lee, judged that although, at 9:53AM on the 18th, the fire alarm went off and character message of ‘Fire’ appeared on the control board, as ‘equipment mal-functioning’ and did not informed the Operating Control Center. As seven more bodies are found in the Daegu subway train No. 1080 on the 26th, 135 bodies are found only in No. 1080, bringing the current count to 189. Total death toll is likely to rise to 200 people after additional identification for one or two days. 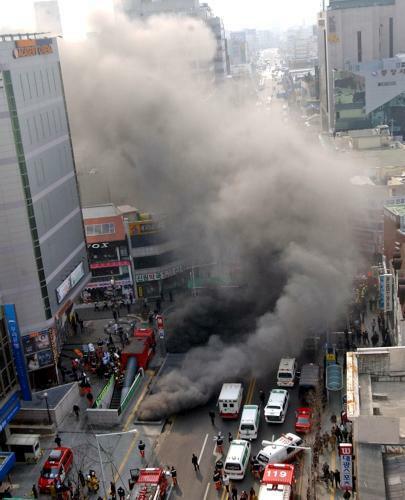 According to the Daegu disaster headquarters, however, over 300 people are reported to have been missing. Even if 200 bodies are identified eventually (currently 47 are identified), it will be still not known whether rest 150 people are dead or alive. What is the exact death toll in Daegu? The Daegu Metropolitan Subway Corp. (DMSC) reported right after the attack that 255 people were in the No. 1079 train (for Ahnshim), and 185 were in the No. 1080 train (for Daegok). As there are almost no remains or bodies in No. 1079 train, it is presumed that most of victims were in No. 1080 train.